India vs Australia 2019: India opener Rohit Sharma is on the verge of piping former India captain MS Dhoni's record of sixes in the 1st ODI at Hyderabad. 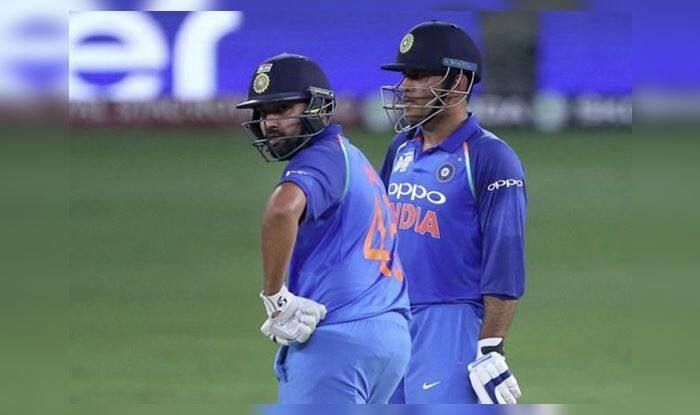 India vs Australia 2019: India opener Rohit Sharma is on the verge of piping former India captain MS Dhoni’s record of sixes in the 1st ODI at Hyderabad. Rohit has emerged as one of India’s best ODI players, he is neck-to-neck when compared to that of skipper Virat Kohli’s in the last two years. With Dhoni and Rohit both locked at 215 sixes for the country, Hitman has the opportunity of going past the former. Mind you, in Dhoni’s ODI career he has hit seven more sixes than Rohit (Seven sixes Dhoni has hit for Asia XI against Africa XI). Given the form, Rohit is in and the fact that he will get to open the batting gives him a bigger chance to go past Dhoni. Meanwhile, at the top of the tree in the list of all-time sixes is former Pakistan skipper Shahid Afridi – who has a total of 351 sixes to his name, including his brief period with Asia XI, ICC World XI, and Pakistan. He is closely followed by West Indies’ Chris Gayle who has hit 351 sixes so far, for ICC World XI and Windies. Dhoni recently touched the 350 sixes mark in international cricket and Gayle became the only cricketer to hit 500 international sixes. “It was a pretty short series to summarise the performances. Australia outplayed us in all departments and deserved to win. 190 is a good total on most grounds but if there is so much dew as there was tonight and when you have an innings like what Glenn Maxwell played, nothing much you can do,” Kohli said at the post-match press conference after T20I whitewash.